Street outreach workers comb public places such as parks, vacant lots, and abandoned waterfronts to search for young people who are living out in public spaces, if not always in the public eye. Street Kids opens a window to the largely hidden world of street youths, drawing on their detailed and compelling narratives to give new insight into the experiences of youth homelessness and youth outreach. 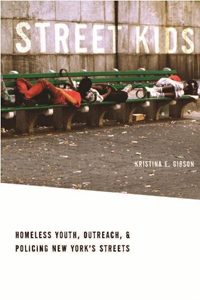 Kristina Gibson argues that the enforcement of quality of life ordinances in New York City has spurred hyper-mobility amongst the city’s street youth population and has serious implications for social work with homeless youths. Youths in motion have become socially invisible and marginalized from public spaces where social workers traditionally contact them, jeopardizing their access to the already limited opportunities to escape street life. The culmination of a multiyear ethnographic investigation into the lives of street outreach workers and ‘their kids’ on the streets of New York City, Street Kids illustrates the critical role that public space regulations and policing play in shaping the experience of youth homelessness and the effectiveness of street outreach.